Preoperative planning with computed tomogram is important for usage of suture anchors in the lateral malleolus. 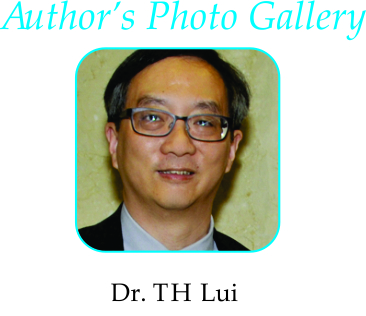 Case Report | Volume 5 | Issue 4 | JOCR Oct-Dec 2015 | Page 73-76| T H Lui. DOI: 10.13107/jocr.2250-0685.352 . Introduction: Eckert and Davis grade 3 superior peroneal retinaculum injury is rare and the optimal treatment is not yet determined. Case report: A 57 year-old lady sprained her left ankle resulting in grade 3 injury of the superior peroneal retinaculum and was treated by endoscopic retinaculum reconstruction. The fracture healed and the peroneal tendons were stabilized. However, it was complicated by protusion of the suture anchors into the posterolateral ankle gutter. The implants were successfully removed endoscopically. Conclusion: Proper selection of the size and dimension of the suture anchor and preoperative planning with computed tomogram is important for usage of suture anchors in the lateral malleolus. Acute traumatic peroneal tendon subluxation or dislocation is usually present as snapping sensation of posterolateral ankle at the moment of injury together with pain and sense of instability around lateral malleolus. It may be difficult to distinguish from acute ankle sprain and this condition can be easily missed in acute situation . High degree of suspicion is needed to detect this injury and prevent the development of chronic peroneal tendon instability. Eckert and Davis  described 3 grades of injury of superior peroneal retinaculum: Grade 1, the retinaculum is elevated from lateral malleolus, along with the periosteum; Grade 2, fibrocartilaginous ridge is elevated with retinaculum; Grade 3, cortical bone rim is avulsed together with retinaculum. Grade 3 superior peroneal retinaculum injury is the only type that can be detected with radiographs of the ankle. We reported a case of Eckert and Davis grade 3 injury which was treated by endoscopic reconstruction of the superior peroneal retinaculum. The peroneal tendons were stabilized and the fracture healed but it was complicated by protrusion of the tips of the sutures anchors into the ankle joint. A 57 year-old lady sprained her left ankle resulting in lateral ankle pain and swelling. There was local tenderness at the posterolateral ankle. 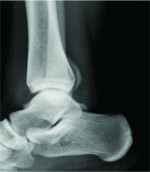 Radiograph showed displaced split fracture of the lateral malleolus (Fig 1). Computed tomogram confirmed cortical rim avulsion fracture and the diagnosis of Eckert and Davis grade 3 superior peroneal retinaculum injury (Fig 2). Endoscopic superior peroneal retinaculum reconstruction was performed (Fig 3). The operated ankle was protected in a short leg cast and non-weight bearing for 4 weeks. Clinically, the peroneal tendons were located in the retromalleolar groove and no subluxation of the tendons was detected. 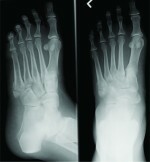 Radiographs taken 2 months after the operation showed radiolucency at the lateral malleolus and the fracture still not healed (Fig 4). 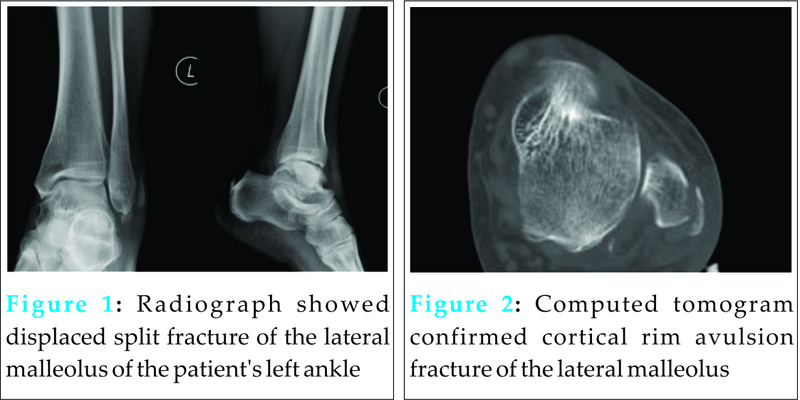 However, the fracture healed up and the radiolucent lesion disappeared 7 months after the operation (Fig 5). However, the patient had posterolateral ankle pain and swelling after walking. The tenderness was located deeper than the peroneal tendons. Magnetic resonance imaging showed that the suture anchors were protruded into the ankle joint (Fig 6). Removal of the anchors through posterior ankle endoscopy  was performed (Fig 7). Her symptoms subsided after the operation. Eckert and Davis grade 3 superior peroneal retinaculum injury is an uncommon injury. The optimal treatment of this condition is not yet well defined. Open reduction and internal fixation of the fracture is a logical surgical treatment option. However, open procedure can induce significant fibrosis around the tendons and the patient may experience posterolateral ankle tightness and discomfort. Endoscopic procedures have been proposed to stabilize the peroneal tendons. These include endoscopic retrofibular groove deepening  and endoscopic superior peroneal retinaculum reconstruction . These endoscopic procedures can minimize the surgical trauma and the degree of peritendinous fibrosis . Endoscopic superior retinaculum reconstruction was used in this case instead of the endoscopic groove deepening technique. Besides stabilizing the tendons, we believed that stabilization of the retinaculum would provide stability to the avulsed fragment and promote fracture healing. It has been confirmed by this case. However, it was complicated by malpositioning of the suture anchors. Suture anchor is widely used in orthopaedic surgery to attach soft tissue to bone. Although complications associated with suture anchor are uncommon, a wide variety of complications have been reported and some of them can be devastating such as articular cartilage or bone loss secondary to a dislodged or prominent suture anchor . They can be classified into suture-related and anchor-related complications. The suture-related complications include tangling of the sutures, suture damage or accidental removal of the sutures from the anchor . The anchor-related complications include malpositioning of the suture anchor. Poorly placed implant can damage the articular cartilage or adjacent nerve [11,12,16]. The complications from hardware dislodgement and migration may be relatively innocent or can be followed by unpleasant or even fatal outcomes [2,17]. This emphasizes the importance of choosing an implant that provides sufficient mechanical strength, especially in osteoporotic bone . Periprosthetic osteolysis and cyst formation has been reported in both metallic [6,14,18] and bioabsorbable  anchors. Concomitant osteolysis can drive to loosening and migration of the implant [6,7] Titanium-induced osteoclastogenesis and micromotion was proposed to be the cause in case of metallic implant. [14,18] Bioabsorbable anchors may result in soft-tissue inflammation, loose bodies formation and rarely allergic reac­tion to the implant [3,12]. The use of suture anchor enhances development of arthroscopic surgery especially in the shoulder and knee. Recent development of arthroscopic surgery of the foot and ankle increases the use of suture anchor at the lateral malleolus, including arthroscopic repair of the lateral ligaments for chronic lateral ankle instability [1,9,10,20] and endoscopic reconstruction of the superior peroneal retinaculum for peroneal tendons instability . The site and direction of insertion of the suture anchor are different in these two procedures. During arthroscopic ligamentous reconstruction, the anchors are inserted into the anterior edge of the lateral malleolus and the anterior talofibular ligament and the inferior extensor retinaculum are sutured to the lateral edge of the lateral malleolus. It has been shown to be effective in returning patients to their pre-injury function level, however, complication rate of 14% has been reported . Many of the complications are suture anchor related and include peroneal tendon irritation, prominent asymptomatic suture knots and iatrogenic fracture [1,9,20]. The peroneal tendon irritation can be related to protusion of the tip of the anchor to the retromalleolar groove. In contrast to arthroscopic lateral ligamentous reconstruction, the suture anchors are inserted to the posterior edge of the lateral malleolus in arthroscopic peroneal retinaculum reconstruction. Instead of protusion of the tip of the anchor into the retromalleolar groove, the anchor can be protruded into the posterolateral ankle gutter, as in this case. The avulsed cortical fracture diminished the anteroposterior and transverse dimensions of the lateral malleolus in the transverse plane and this increased the risk of protrusion of the tip of the anchor in all direction of insertion. The insertion of the anchor in the lateral-medial direction as in this case was even more risky as the transverse dimension of the lateral malleolus was shorter than its anteroposterior dimension. It was not detected during the initial operation and subsequent radiographs because non-metallic implants were used. Computed tomogram with transverse view of the lateral malleolus can be used for preoperative planning of arthroscopic lateral ligamentous reconstruction of superior peroneal retinaculum reconstruction. This allows the surgeon to select the anchor of appropriate size and length and the correct site and direction of insertion [8,11]. In general, anchor of spike mechanism would be more suitable than that of screw-in mechanism as the length of the anchor is shorter. Moreover, the direction of insertion is best along the diagonal of the lateral malleolus as it is longer than the transverse or anteroposterior dimensions. Finally, if a patient complains of unusual mechanical symptoms after using anchors, further investigation is needed to detect this complication [8,16,17]. This includes computed tomogram if metallic implant is used and magnetic resonance imaging in case of non-metallic implant. Proper selection of the size and dimension of the suture anchor and preoperative planning with computed tomogram is important for usage of suture anchors in the lateral malleolus. Grade 3 superior peroneal retinaculum injury can be treated with endoscopic superior peroneal retinaculum reconstruction. The size and the direction of insertion of the suture anchors should be carefully planned with preoperative computed tomogram. 1. Acevedo J, Mangone P. Arthroscopic lateral ankle ligament reconstruction. Tech Foot Ankle Surg 2011;10:111-116. 2. Antonogiannakis E, Yiannakopoulos CK, Karliaftis K, Karabalis C. Late Disengagement of a Knotless Anchor. Arthroscopy 2002;18: E40:1-4. PMID:12368800. 3. Barber FA. Biodegradable Shoulder Anchors Have Unique Modes of Failure. Arthroscopy 2007;23: 316-320. PMID:17349477. 4. De Leeuw PAJ, van Dijk CN, Golanó P. A 3-Portal Endoscopic Groove Deepening Technique for Recurrent Peroneal Tendon Dislocation. Techn Foot Ankle Surg 2008;7:250-256. DOI: 10.1097/BTF.0b013e318183a22a. 5. Eckert WR, Davis EA Jr. Acute rupture of the peroneal retinaculum. J Bone Joint Surg Am 1976;58A:670-673. PMID:932065. 6. Giannikas D, Athanaselis E, Matzaroglou C, Saridis A, Tyllianakis M. An unusual complication of Mitek suture anchor use in primary treatment of flexor digitorum profundus tendon laceration: a case report. Cases J 2009;2:9319. PMID:20062642. 7. Goeminne S, Debeer P. Delayed migration of a metal suture anchor into the glenohumeral joint. Acta Orthop Belg. 2010;76:834-837. PMID: 21302585. 8. Grutter PW, McFarland EG, Zikria BA, Dai Z. Petersen SA. Techniques for suture anchor removal in shoulder surgery. Am J Sports Med. 2010;38:1706-1710. PMID: 20566718. 9. Jordi V, Pau G, Alexandro P, Eduard R, Fernando P. All-inside arthroscopic lateral collateral repair for ankle instability with a knotless suture anchor technique. Ankle Foot Int 2013;34:1701-1709. PMID: 23978706. 10. Kim ES, Lee KT, Park JS, Lee YK. Arthroscopic anterior talofibular ligament repair for chronic ankle instability with a suture anchor technique. Orthopedics. 2011;34(4), 2011. PMID:21469637. 11. Kim SH, Koh YG, Sung CH, Moon HK, Park YS. Iatrogenic Suprascapular Nerve Injury After Repair of Type II SLAP Lesion. Arthroscopy 2010;26:1005-1008. PMID: 20620802. 12. Lorbach O, Wilmes P, Brogard P, Seil R. Complications related to Implants in arthroscopic shoulder surgery. Orthopäde 2008;37:1073–1079. PMID:18813907. 13. Lui TH. Endoscopic peroneal retinaculum reconstruction. Knee Surg Sports Traumatol Arthrosc 2006;14:478-481. PMID:16261351. 14. Mirza A, Reinhart MK, Bove JJ. Index Radial Collateral Ligament Repair with Titanium Mini-Suture Anchor: Osteolysis Complication of an Underreported Injury. HAND 2010;5:294–298. PMID:19826880. 15. Nusselt T, Freche S, Klinger HM; Baums MH. Intraosseous foreign body granuloma in rotator cuff repair with bioabsorbable suture anchor. Arch Orthop Trauma Surg 2010;130:1037–1040. PMID:20526849. 16. Rhee YG, Lee DH, Chun IH, Bae SC. Glenohumeral Arthropathy After Arthroscopic Anterior Shoulder Stabilization. Arthroscopy 2004;20: 402-406. PMID:15067280. 17. Silver MD, Daigneault JP. Symptomatic interarticular migration of glenoid suture anchors. Arthroscopy. 2000;16:102-105. PMID:10627354. 18. Sonnery-Cottet B, Mortati R, Gadea F, Thaunat M, Moyere F, Chouteau J. Osteolysis of the tibial plateau after meniscal repair with hybrid suture anchor. Knee Surg Sports Traumatol Arthrosc 2013;21:2137–2140. PMID:23138233. 19. Van Dijk CN, Scholten PE, Krips R. A 2-portal endoscopic approach for diagnosis and treatment of posterior ankle pathology. Arthroscopy 2000;16:871-876. PMID:11078550. 20. Wang J, Hua Y, Chen S, Li H, Zhang J, Li Y. Arthroscopic Repair of Lateral Ankle Ligament Complex by Suture Anchor. See comment in PubMed Commons belowArthroscopy 2014;30:766-773. PMID:24680321.